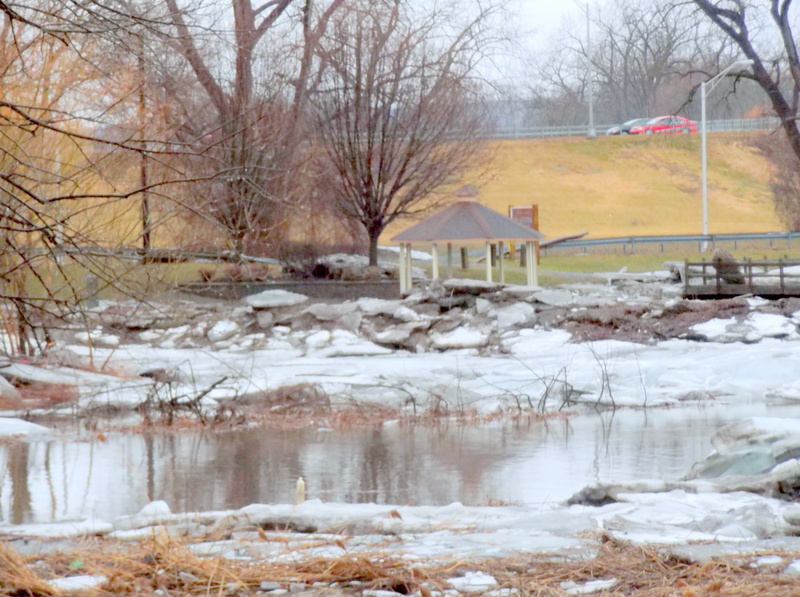 update (Sunday, Feb. 25): My visit before noon to the Mohawk riverbank along the Schenectady Stockade revealed that the River channel south of the Isle of the Cayugas and entire River east of Scotia’s Burr Bridge embankment was clear, with occasional small chunks of ice moving rapidly by. [see image above on Right; click for a larger version] Two other observations: First, the channel along the south/Scotia side of the Isle of the Cayugas is still clogged with ice cover and floes, basically up to the east tip of the Isle. 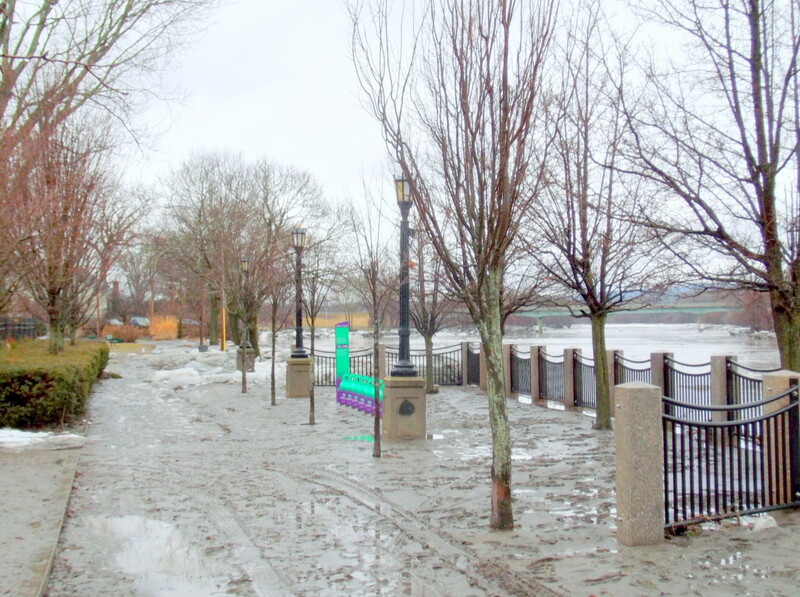 Second, the Esplanade (like virtually all of the Park) is a muddy mess. See the next two images. And, see the Sunday Slideshow at the bottom of this posting. According to the NWS Hydrograph, the water level observation at 4:40 PM today at Freeman’s Bridge was 213.71ft, and the latest prediction has the level stay below 214 ft. for the next two days. 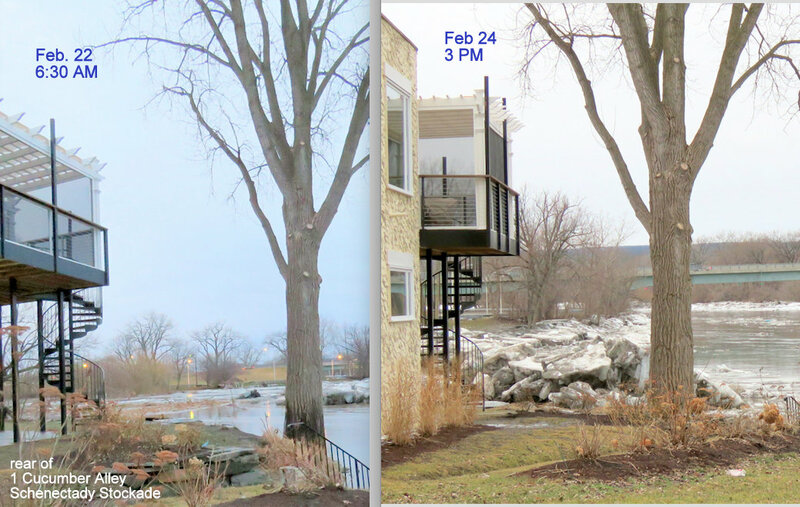 If, as of Sunday February 25, you want to see closeup large ice floes along the Stockade riverbank, you should head to the river end of Cucumber Alley. Don’t let the Stop Sign fool you, Cucumber Alley still a roadway that goes all the way to the River and is open to the public. 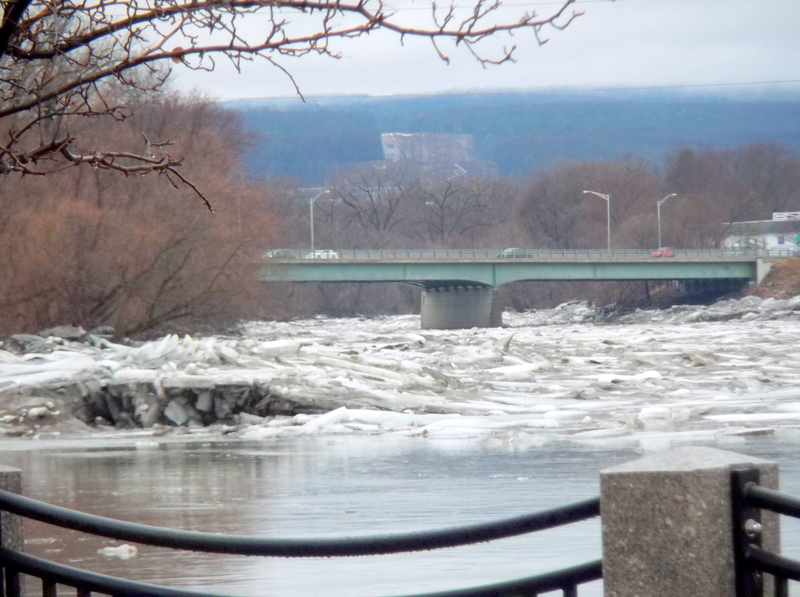 A shifting mass of ice and floes (and debris), along the Schenectady Stockade portion of the Mohawk River today (Saturday), was a good reminder that people in the flood-prone part of the Stockade, and the City’s emergency response team, need to be prepared and vigilant. 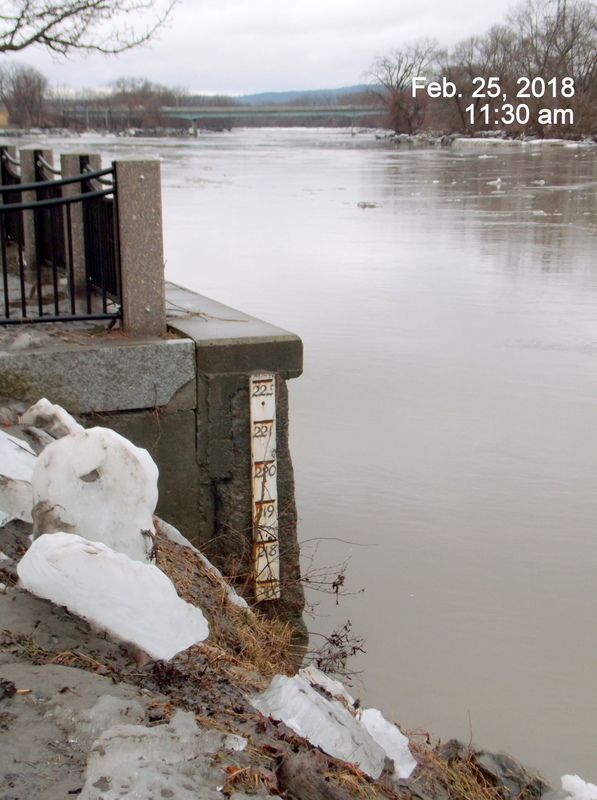 The flow of the River has been quite powerful, but that is a mixed blessing if the ice cover breaks up and forms an ice dam; and, the force of the current itself can make such breaking of the ice cover more likely. As of 8 PM Saturday, the water level at Freeman’s Bridge was 214 ft., with Flood Stage being 220 ft. 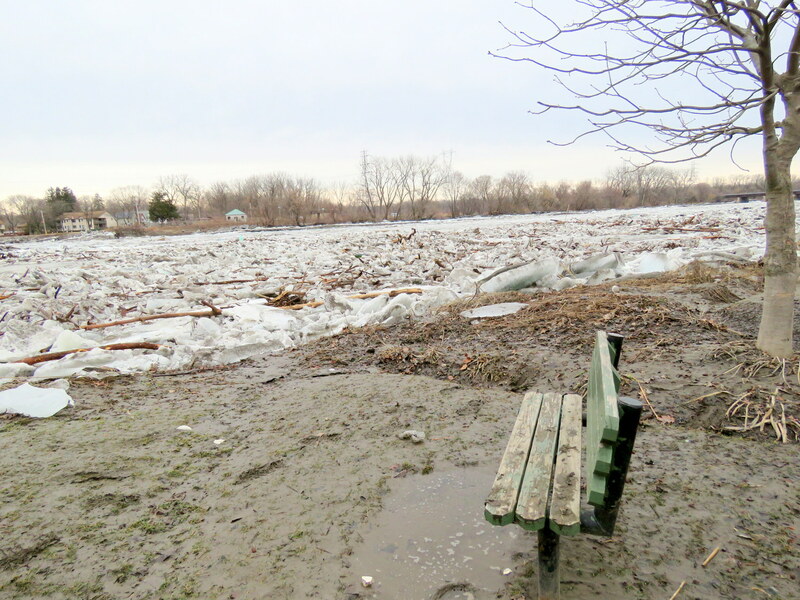 The pair of images at the Riverside Park Esplanade at the top of the posting shows that the broad open water along the Park on Thursday was filled today with ice floes. Immediately below is another view along the Stockade riverbank from the west end of the Park, at the Washington Avenue dead end. Click on an image for a larger version. Footwear Alert: Riverside Park was a muddy mess today, and I hear people were losing boots and shoes. 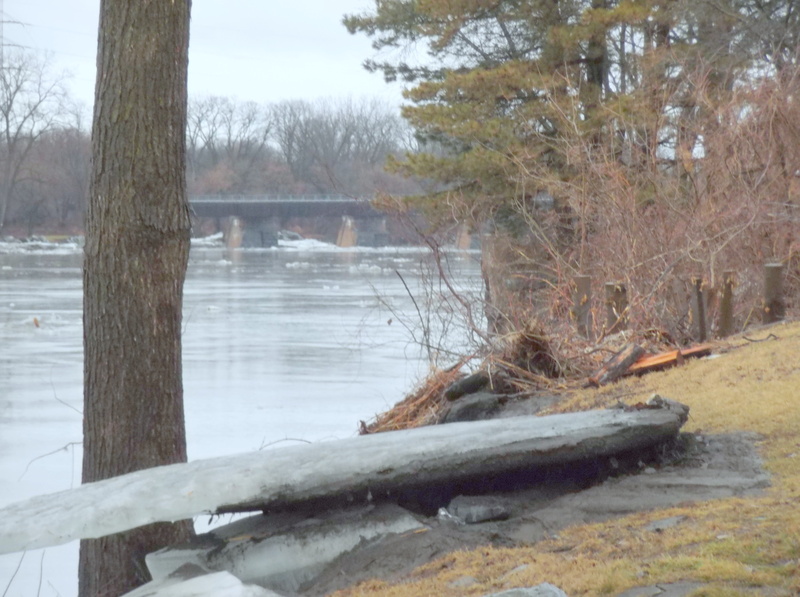 I barged toward my favorite bench near the west end entrance columns in the Park and was soon scolding myself and looking for a safe way back to reasonably dry land. A new collection of large and scruffy ice floes appeared today at the end of Cucumber alley and the mouth of the Binnekill. Here is an example, and there are quite a few more in the Saturday Slideshow below. This Saturday Sideshow consists of photographs taken at the end of Cucumber Alley and along Riverside Park in mid-afternoon. Don’t Forget: You can see a larger version of any photo in the Slideshow by pausing the Slideshow, right-clicking on the desired photo, and choosing See Image in a Separate Tab. A lot of the images look better when larger. 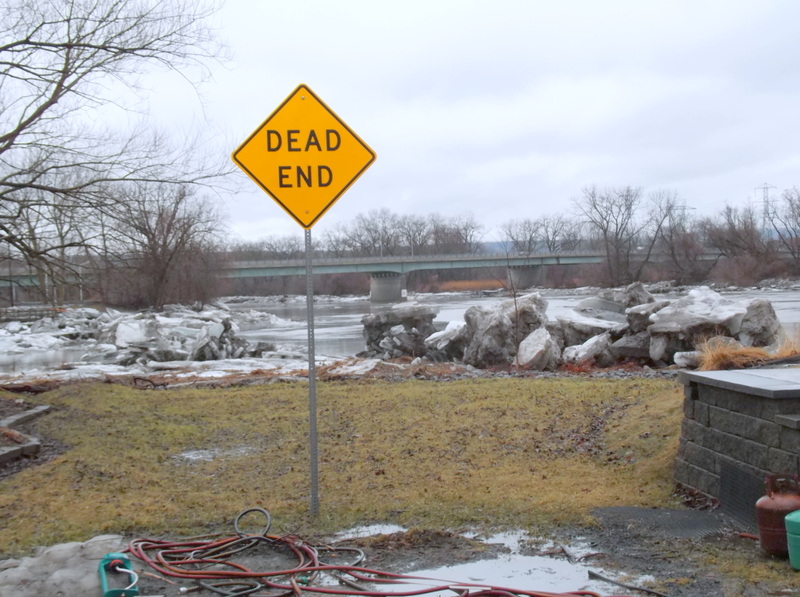 Sunday Slideshow: images taken at the rear of Cucumber Alley and along the Schenectady banks of the Mohawk River between 11 AM and noon, on Sunday, February 25.